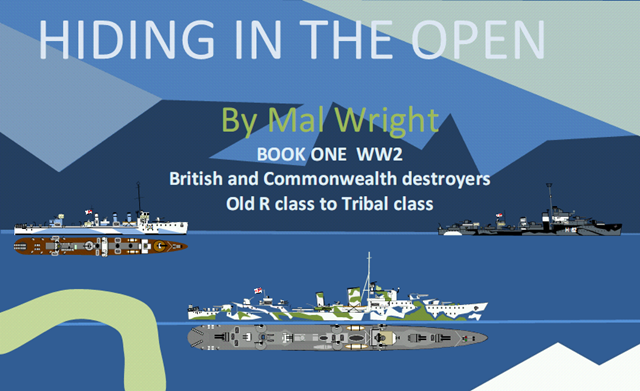 Hiding in the Open, Book 1, is the first of a series of books from writer, naval artist and wargamer Mal Wright covering the camouflage worn by ships during the Second World War. Over the years Mal as has amassed a multitude of information concerning the colour supported by various ships in the Second World War. 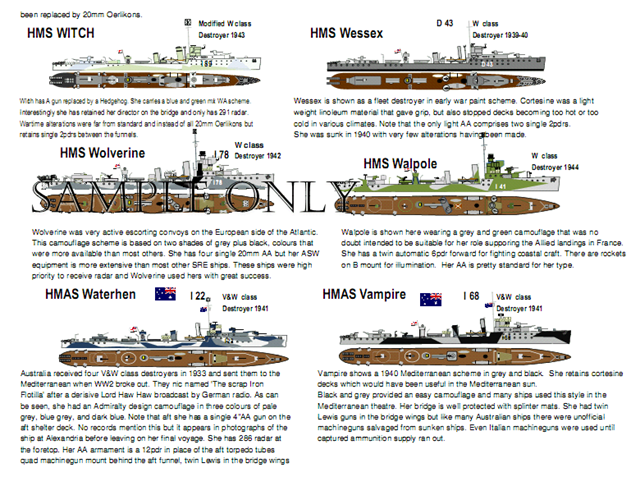 Some of this information was being seen for the first time when Mal published his Convoy Naval Wargame. This then is the opening shot in what I hope will be a long campaign of information on World War 2 ship camouflage. The book itself is released in PDF format only and costs around AU $20. This volume is a pictorial study of the British and Commonwealth Destroyers of World War 2; old R class to Tribal class destroyers along with vessels such as HMS Ambuscade ((one of the first destroyers of the British fleet created taking into account experience learned in World War One. Along with Ambuscade, Amazon was also built. They were built under the 1924 program, designed by the builders. The Admiralty stipulated only the fulfilment of some obligatory conditions on armament, endurance range, seaworthiness and habitability. Full freedom was allowed for the designers apart from those mandatory conditions. They were armed the same as the Modified W class ships. New destroyers should exceed them by 2-3kts, that is, new destroyers should achieve 37kts against 34-35kts of these two)) and HMS Defender. Three colour schemes are shown for Ambuscade whilst the Defender is shown in her China Station colours of white hull and yellow superstructure – very attractive too. 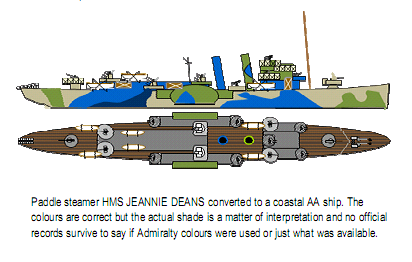 In fact, the book illustrates many vessels in multiple pictures, tracing the change in camouflage applied to the vessel as the war progressed. There are 144 full colour drawings in the book displaying a range of camouflage patterns. Also discussed is any change of armament, electronics etc. The pictures display both an elevation and a plan view, so finally you can work out where that pesky corticene ((WW2 Corticene was a linoleum, held down by thin brass strips. It’s colour was generally a medium brown – described as the colour of milk chocolate, although that would vary depending on exposure to the elements and manufacturing inconsistencies)) or semtex ((Semtex was a trowelled-on latex-based non-slip composite material. There were originally three manufacturers which may account for the the varying colours reported early war. By late war a “Dunlop” green seems to have become standard)) deck goes and what colour it was. This guide, and the ones that follow allow the wargamer to easily find details of the camouflage used by his vessels as well as get an understandijng understanding of how the camouflage changed as he war progressed. It is also a valuable soucrce source for the modeller. These books have been many years in the coming. I started collecting the material decades ago and they represent a lifetime’s work on the subject. Editions coming include German and other nations besides more British & Commonwealth. The guides will cover everything from Battleships and aircraft carriers right down to minor craft and auxiliaries. Many of the drawings are already done and its just a matter of adding more and then collating the books. The book itself is organised in landscape mode as this permits 4 drawings per page comfortably and, if printed, will sit up nicely on a desk whilst painting. The format is US letter size but these days reformatting for an A4 printer is a simple, automatic matter. Indeed, a hidden bonus of the US letter size is that the document formats perfectly in my iPad. As I mentioned, there are 144 drawings through the book spread across 25 pages. In addition, there are a further 5 pages od introductions and technical discussions. the book is rounded out with a bibliography so one can go chasing further information. A sample page is shown to the right. Each named plan in the book is accompanied by a brief history or details of the electronics or camouflage changes. There is also a discussion usually of why a particular camouflage was used. The book also covers the reasons for apparent non-standard schemes or variations in colours by explaining the concept of TLAR ((That Looks About Right)). There are a couple of typos through the book as well although nothing to really detract from the overall quality of the work. Best of all, however, is the discussion on Mountbatten Pink in relation to HMS Stronghold and HMS Thanet.. The book is published as a pdf document and is very reasonably priced at AU $20.00. It can be purchased using PayPal by contacting Mal via email at mgwright@bigpond.net.au. He will then invoice you for the publication and send you a download link for your purchase once payment is received. In addition, if you prefer to use credit card rather than PayPal itself, Mal has organised with Phil at Spirit Games to purchase Hiding in the Open, or indeed, the whole Rising Storm offer using your credit card. Just got to the Spirit Games website and once purchased, Spirit Games will provide the downloads. “…is the opening shot in what I hope will be a long campaign…” which is confusing because it appears that another person is writing about Mal and suddenly in the next sentence it become clear that Mal himself is writing the article. It needs to be one or the other, preferrably ‘another person’ seeming to be writing about Mal which means that ‘person’ can give Mal all sorts of wrap-ups and praise without Mal appearing to be giving himself all the glory and therefore seeming to big-noting himself. It’s okay for Mal to write the article because it’s only Mal who can supply the info but Mal should keep it in the third person so it appears the ‘writer’ is the one giving Mal the wrap-ups he genuinely deserves. I’m sure you’ll understand the importance of my comment without me appearing to be critical which I am not. I honestly believe Mal is a great guy and truly knowledgeable and professional and I am proud of my little brother being such a world-wide popular figure. Go to it Mal but keep it in the third person, okay? Okay! The typos on the page are mine, as indeed is the writing of the article. With regards to the use of third and first person, well, where I have quoted Mal’s words directly, that is in the “blockquote” area, which is a way in most CMSs to indicate a lengthy quote from other than the author of the web log post. For the record, I < — that's me, no one else | do hope it will be the start of a long campaign of information on World War 2 ship camouflage. That was also posted as a “blockquote”. Nice post. Keep updating it and sharing such Incredible information.